If you put the word ‘Baked’ and ‘Crispy’ in the same sentence, I’m bound to pay attention, especially if it involves a vegetable of some sort. 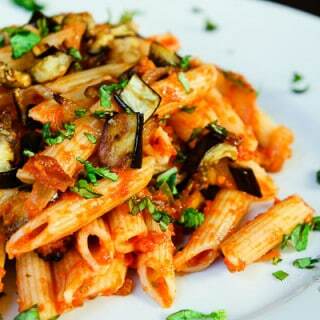 Now if you say that vegetable is mushrooms, I’m ALL IN! 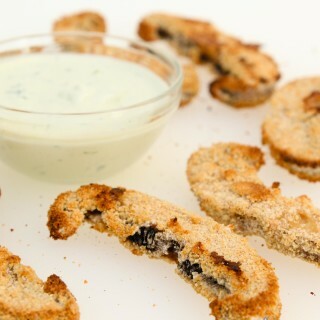 These Baked Crispy Portobello Mushroom Fries will be devoured as soon as you take them out of the oven. At least that’s what happened to the the first batch I made. But lucky for you guys, I made a second batch the next day so I could photograph them and share the recipe. 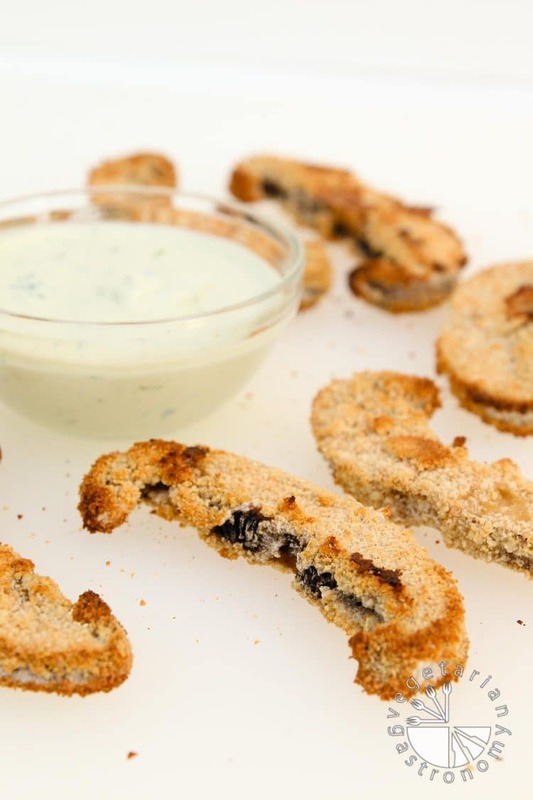 These mushroom fries were inspired by Veggie Grill. They served mushroom fries on their menu several months ago, and they were simply amazing. As the season changed, they took them off their menu, which left me in my kitchen trying to recreate them. The mushroom fries at Veggie Grill were very lightly coated and then deep fried to make them crispy. I’m not a huge fan of frying, so I came up with a baked version. 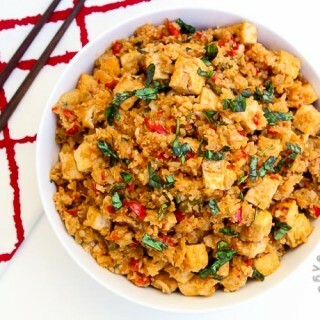 After a few trial and errors, I finally found the perfect recipe that actually ended up quite different than Veggie Grill, but still amazing, nonetheless (and much healthier!). The key to this recipe is the batter. I needed some type of batter to coat the mushrooms prior to baking in order to make them crispy since frying was out of the question. Yet, I didn’t want something so thick that it would overwhelm the flavor of the mushrooms. So I used Soda Water…the key ingredient in the batter making these fries irresistible. If you’ve never cooked or baked with soda water, it works very well. Soda water gives a lovely light batter due to the carbonation that’s just perfect for these fries. Serve them with a side of my Vegan Cucumber Ranch or Vegan Chipotle Aioli, or enjoy them on their own, like I did. 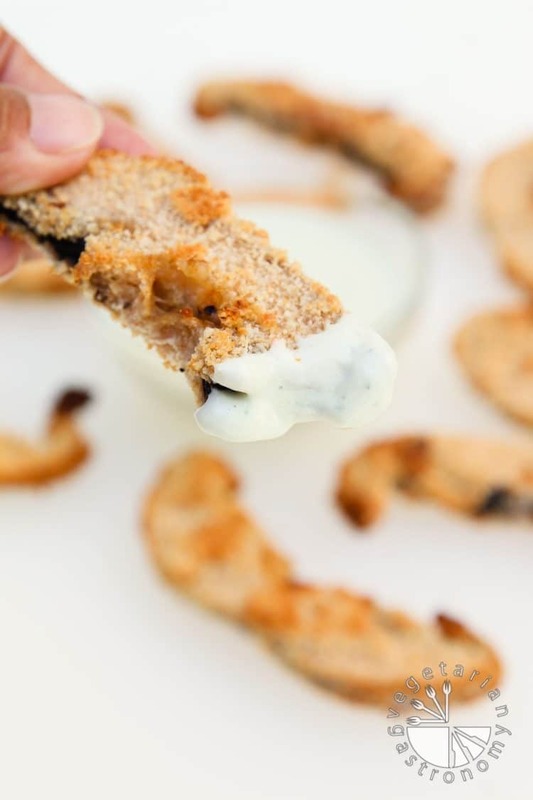 I promise you’ll find yourself devouring the entire batch of these Baked Crispy Portobello Mushroom Fries! This is the best way to devour mushrooms in minutes! 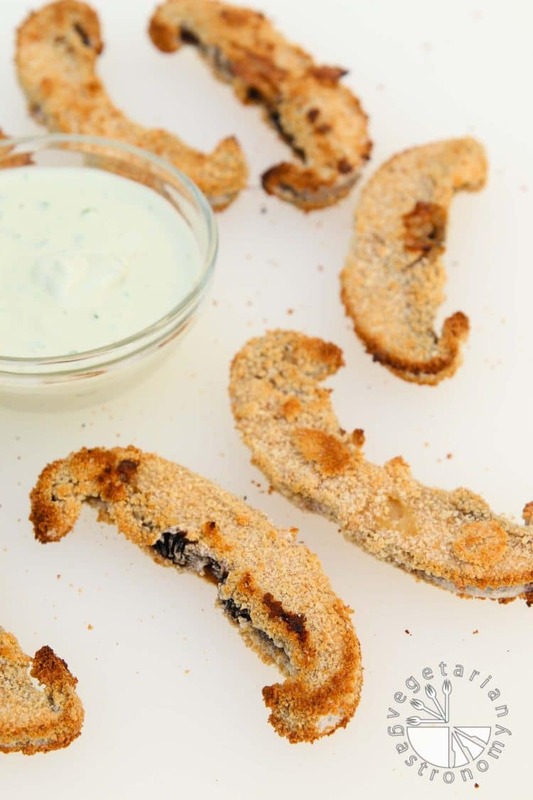 Crispy, tender, and healthy baked mushroom fries dipped into a delicious vegan ranch! Preheat the oven to 425 degrees. Line a baking sheet with parchment paper . Prepare the portabello mushrooms by washing, drying completely, removing the stems, and cut into 1/4-inch thick slices. Add some of the breadcrumbs into a bowl for coating. Add more as needed after you start breading the mushroom slices. In another medium bowl , combine all the ingredients for the Batter in the order listed and whisk until completely mixed. Dredge each slice of mushroom into the batter to coat thoroughly on both sides and then into the breadcrumbs. 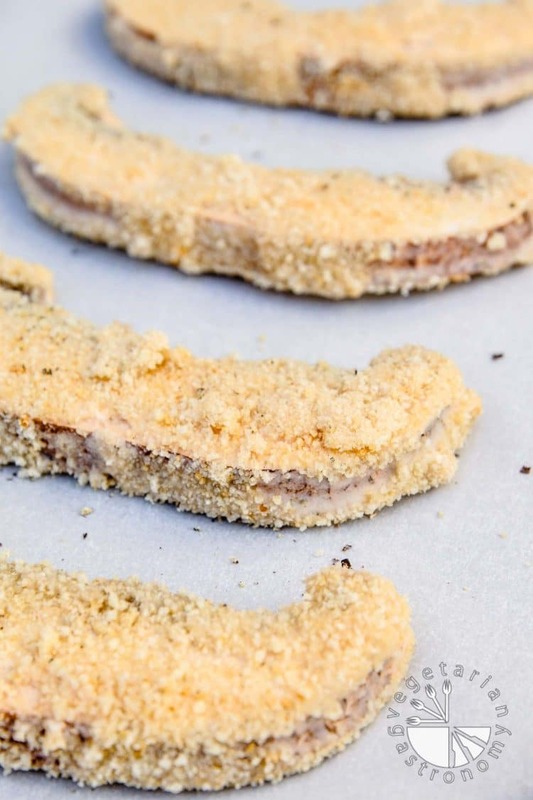 Place the breaded mushroom slices on the parchment lined baking sheet. Note: Keep the whisk handy so that you can quickly whisk the batter mixture when needed if you feel like the contents of the batter start to settle (this will probably happen after prepping 2-3 mushroom slices). 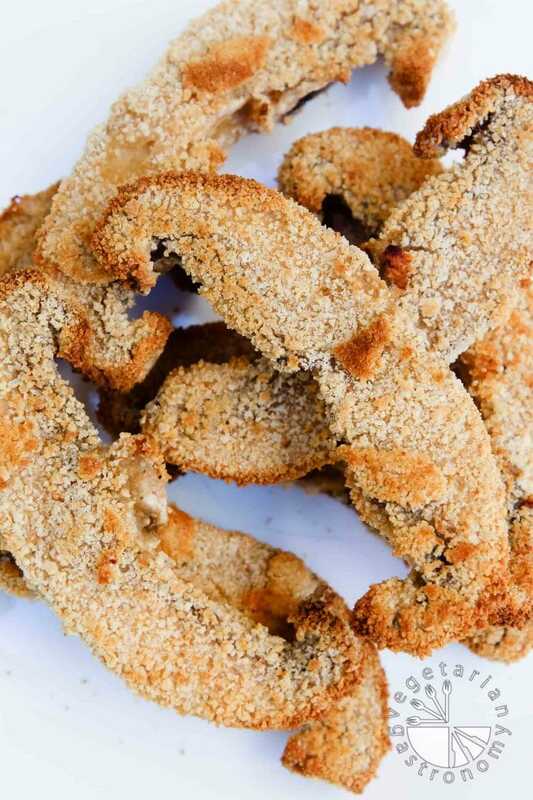 Once all the mushroom slices are breaded and placed in a single layer on the baking sheet, sprinkle some sea salt and freshly ground black pepper, and bake them in the oven for 20-25 minutes. 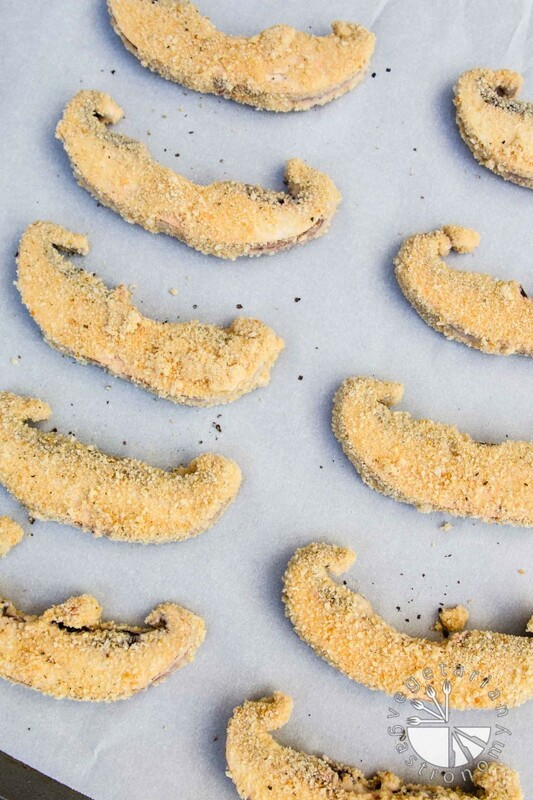 Flip half way through so that they bake for 10-12 minutes on each side or until golden brown and crispy on the outside. Enjoy them with a side of some vegan cucumber ranch or chipotle aioli . why did you remove the mushroom stems? I typically always remove the portabello mushroom stalks before using (not the dark gills, just the stalk/stem part)...more of a preference really. It of course would be fine keeping them on, which ever you prefer, these fries will taste great regardless! Let me know if you try them out. 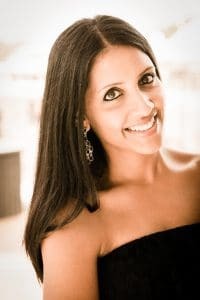 Thanks Rashmi!! You will love them! I'm hoping to post a taco recipe using them soon...I love anything crispy containing mushrooms! Oh yes, pretty much anything will go with these fries. Although to tell you the truth I devoured the entire first batch plain without dipping into anything, they were delicious ha! Thanks Reshana! It was so good. Thanks.